A prominent Florida attorney was presented with the CCHR Humanitarian Award during a banquet held at the historic Fort Harrison in downtown Clearwater for his work to expose and prevent fraudulent involuntary psychiatric examinations known as Baker Acts. Hundreds of guests attended the 2nd Annual Citizens Commission on Human Rights (CCHR) Humanitarian Awards Banquet for the purpose of honoring the many dedicated volunteers and supporters of CCHR for their work in the field of mental health reform. 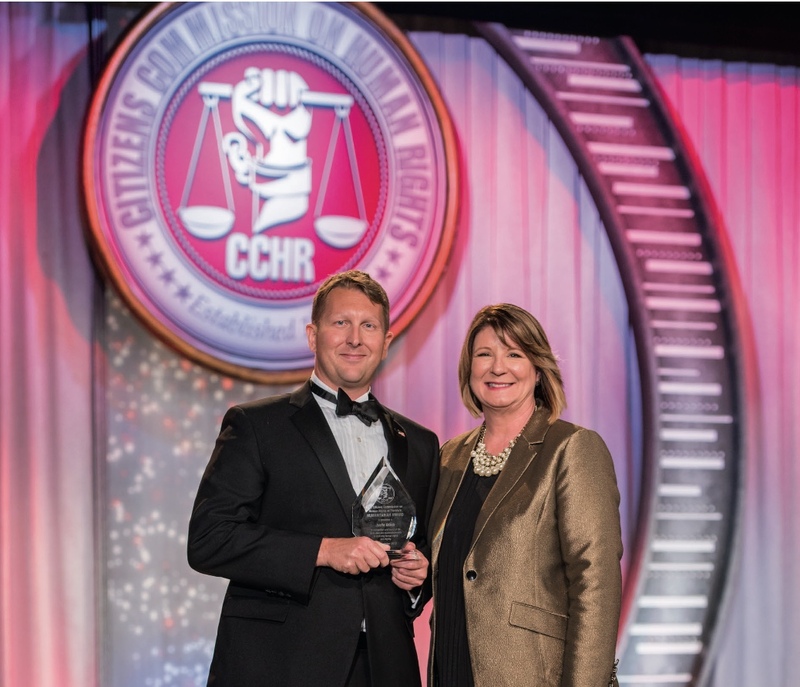 The guest of honor, and recipient of the 2017 CCHR Humanitarian Award, was Jacksonville attorney Mr. Justin Seth Drach for his work to end unlawful Baker Acting of men, woman and children in Florida. While the original intent of the Baker Act was to ensure patient rights and prevent abuse, the Annual Report of Baker Act Data, revealed in March that in the 15 years from 2001 to 2016, involuntary examinations more than doubled, a 105.50% increase, and that 32,475 of these initiations were on children. Even more disturbing is that the mental health law allows for a child to be Baker Acted without parental knowledge. Spearheading a campaign at the beginning of 2016 to put an end to this violation of parental rights, CCHR Florida, a non-profit mental health watchdog working to expose human rights violations in the field of mental health and dedicated to the protection of children, has worked to educate families on their rights under the law at hundreds of community events reaching almost 150,000 families in the Tampa Bay area in addition to calling upon Florida lawmakers to eliminate the unjust Baker Acting of children. “It should not be legal for a child to be taken into custody and sent for involuntary psychiatric examination without parental knowledge when the child does not meet the criteria for a Baker Act, yet this is what is happening in Florida,” said Diane Stein, President CCHR Florida. Stating that Florida is a target-rich environment for corporations looking to squeeze profits from filled beds and that the mental health act is weak, Mr. Drach called upon those in attendance to empathize with the mother, father, son, or daughter who has been locked behind steel doors because they have good insurance, or because the state of Florida will subsidize their bed and asked them to contribute to the legacy of putting an end to the atrocities of mental health abuse. For more information on CCHR’s campaign to eliminate inappropriate Baker Acting of children please visit 5 Simple Steps to Help Protect Your Child, or contact CCHR at 727-442-8820 or visit the center at 109 N. Fort Harrison Ave in Clearwater, Florida. We have an issue in the family with my mother-in-law regarding her mental capabilities. She is 81.5 years and for the last 4 years has accused her husband of stealing everything from her. Most recently she became violent and damaged a new SUV of husband because he did not discuss buying this vehicle. She took a metal threshold and struck his vehicle while parked in garage. She then went to his bedroom ( door is locked) at 5 am and pounded on the door until husband got up. She yelled at him telling him to get that f……car out of “my” garage. She also parked in the two car driveway so he could not leave. All family members per her are prohibited from speaking to her PCD. Her son did call the doctors office and tell them she is becoming violent. All to no avail. Her daughter committed suicide by using a handgun to the head. He sister has mental health issues that she won’t let her be examined. We are at our witts end because she can be Jexel and Hyde. Calling the police would be fruitless. She cannot understand her medications and needs help placing pills out. She is now demanding the sale of the martial home. Please advise something we can do to get her examined by a doctor who deals with dementia.Thank you. Thank you for contacting us. Someone from our organization will email you the information requested.